It barely took a month before the PBA went into action again with the Philippine cup ending in dramatic fashion. Now, here we are looking as team are ready to go out and fight with their new comrades for the title of Champions of the Commissioner’s Cup.In this section, I will try to take a small recap of each PBA game during the week and pick apart the parts that I am interested in because, well, it is my blog. But I promise you that I will try to make them as enjoyable as possible. Don’t forget that instead of waiting so long for each write up, you can follow me on twitter (@tonesNdef) or on Facebook. It took only two plays into the game that I could get from the replay video for the imports to show their stuff. Global Port import, CJ Leslie, immediately unleashed his youth and penetration ability on the KIA Carnival defense. Peter John Ramos, KIA Carnival Import, couldn’t wait to avenge the defensive lapse and went to the other side..to launch a long mid-range jumper which clanged off the rim (unsurprisingly). Ramos followed that up on the next possession by setting a high screen and popping out, followed by a call for the ball and a three point attempt. It was quite clear early on why the KIA Sorento had the team name changed to KIA Carnival when you possibly the most entertaining import on their roster. even if Kelly Nabong doesn’t approve it. The lead for Global Port grew quite quickly as KIA basically gave them anything they wanted and ended up shooting 50.6% from the field. Global Port’s Shot Chart vs KIA via Humblebola. KIA made a couple of runs here and there to make it a bit more entertaining, but eventually the Piermen became the first team to break the century mark in the first game of the season with a 100-89 point win. Stat line of the game does not represent the best stat line of the game, just the one I liked the most. CJ Leslie posted an impressive 31 points (11-18), 14 rebounds, 5 block, 4 assists line. But that was pretty much expected from the athletic import. Was it outstanding? Yes. Was it eye-popping? Relatively to the next guys, not so much. The super rookie surrounded with rumours, Stanley Pringle, has a great game scoring 17 points on only 8 shots, while grabbing 8 rebounds and dishing 4 assists. Once again, great numbers. But this is Pringle we’re talking about. This is a normal day at the office. Former Global Port player (and call up player for the Saigon Heat in the ABL), Mark Yee, had quite an outing against his former team. He went for 15 points and 5 rebounds. Not totally impressive numbers, but this is a guy that averaged 4 points in 20 minutes for a conference. 41 points, 15-24 shots, 11-13 free throws, 20 rebounds, and 6 assists. Okay. Let’s calm down a bit. 41 points is certainly eye-popping, but when your team’s second leading scorer is Mark Yee, I guess someone had to step up large. Apart from a couple of ill advised long range shots, PJ Ramos still had a nice FG% and he isn’t afraid to be fouled either hitting 11-13 free throws. His 20 rebounds are expected from someone who is SEVEN FRICKING FEET AND THREE INCHES. But what I liked the most was his 6 assists. Sure he held the ball a lot, but the way that he handled himself when getting double teamed and the precision of passes out of the double team is something all seven footers should take after. Note that I’m not saying he’s the player of the game. His defense was far too atrocious and slow-footed for that honor (how do you block only 3 shots when you are 7 foot 3?). But his stat line was surely a crazy one. This was an intriguing matchup. Well, of course, because it’s the Gin Kings who are always going to be intriguing to watch no matter what. Ginebra Import, Michael Dunigan, was first tapped by the Meralco Bolts before eventually be snatched up by the Mighty Red. And well, maybe their were some emotions left bottled up. Love the way John Ferriols doesn’t back down for a second. And he loves how his team mates don’t back down. Ginebra slacked of on boxing out to grab defensive rebounds and struggled to force turnovers, which are the two most crucial things to ignite a run-and-gun game. So it was natural that they trailed early on. But some point during the third quarter, they figured that Greg Slaughter was in fact on their team and pumped the ball into him leading to his 23 points off 9-14 shooting. Later on, Ginebra remembered they were trying to Run-and-Gun and just went back to ignoring Slaughter. 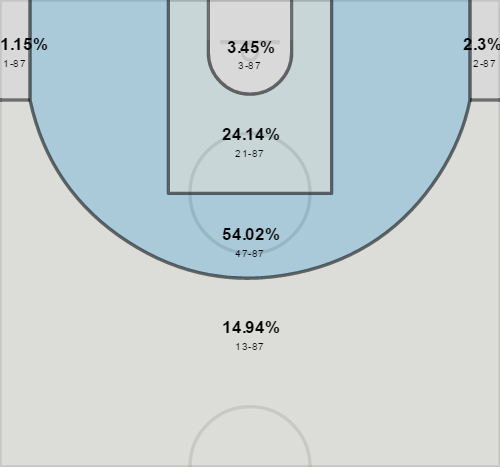 Slaughter may have led the team in shot attempts, but LA Tenorio attempted 12 shots which is two more than MICHAEL DUNIGAN and about 10 more than he should have taken in a game where they had so much height dominance. Watching this game with barely any past reference for both teams, it was hard for me to not like the Meralco Bolts. They had the aforementioned Josh Davis who hustled almost as much as a benchwarming scrub. They had Reynel Hugnatan and his glorious ponytail. Mike Cortez plays one of the smoothest games in the league. Gary David is one of the most purest scorers I’ve seen in this league. And yes, he did so quite inefficiently, scoring 21 points of 19 shots, but the manner at which he took each of his shots was so beautiful. There were some shots where the defender did all he could and it still didn’t matter. David missed plenty of shots, but I’d hate to imagine what it like to see him on fire. And of course, there’s Cliff Hodge. I was warned by one of my PBA fan friends that, if you liked Abueva’s intensity, keep an eye out on Cliff Hodge. And I wasn’t disappointed at all. The dude was all over the place like a pet jackrabbit owned by a cocaine dealer that found it’s way into it’s owner stash. That jackrabbit wold also have to be jacked up like crazy too. The guy draws haters like he’s a hate magnet. Actually, if one day they actually created a hate magnet, they’d name it Abueva & Hodge. I like this picture because Abueva and Hodge always appear to be on the floor and its where most of their haters hope they are everytime they play. That’s it. I’m on the Hodge bandwagon even if all the villagers will throw pitchforks and rotten eggs at me the whole way. This GIF might set a record for “monitors destroyed by punching at annoying face”. Ginebra couldn’t handle the Hodge (or the Davis, the David, the Cortez) and ended up opening their new conference with an 85-74 loss. 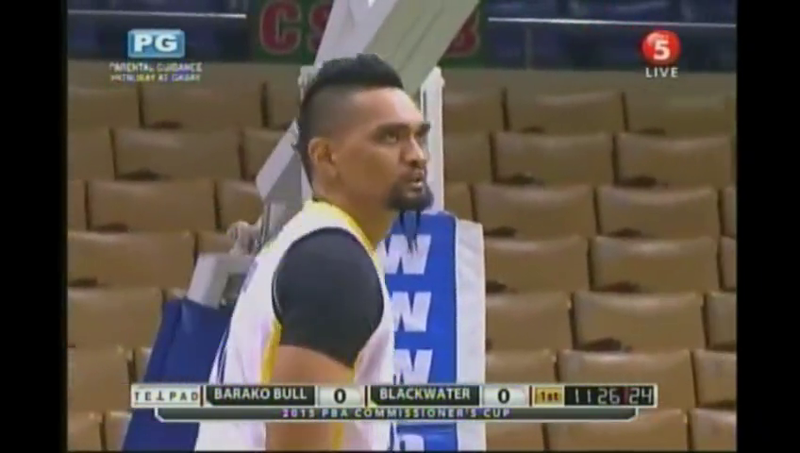 LA Tenorio: 1-12 shooting, 1 assist, and 4 personal fouls. It might be that there’s a lot going on in his head right now with all the Pringle-Tenorio rumor going around, but still…1-12 shooting is just plain brutal. 3 fastbreak points for the run-and-gun Ginebra Kings. Plus they played at 90.1 pace, which is roughly the same as last conference’s average among all teams. Are they sure that running and gunning is their thing? On a sad side note, Josh Davis got to celebrate his victory for only a short time before his phone got stolen after the game. Welcome to Manila. This was supposed to be my game of the week as I had riled up quite a following from Thailand to watch this game with ABL heroes Christien Charles and Jerick Canada recently signing up with the Blackwater Elite side. This was supposed to be the game where ABL Legends showed the PBA that the ABL is not a laughing stock league for their future stars to just pass through. But when game time came, Jerick Canada was nowhere to be seen and Chris Charles was sidelined with a Hamstring injury. BRIAN FAUNDO’S BEARD from now on will be my go-to exclamation phrase for when I see something so awesome I can’t describe how awesome it is. It’s like at any moment he’s going to evolve into a dragon. Other than his beard, Brian Faundo has possibly THE BEST shot celebration ever. I wouldn’t be surprised if I complied a list of 10 shot celebrations of this conference and Faundo would domniate at least half the list. He’s already the front runner for the honor with this beauty. Imagine how miserable it has been for Sol Mercado the past month or so. He went from star point guard of the eventual Philippine Cup champions (San Miguel Beermen) to star point guard of the Barako Bull Energy. The Bull are that bad (as of release of this article, the Bull are 2-0, something that the Beermen can’t say because they’ve yet to play a game yet). Alex Cabagnot was great for the Beermen in their Championship run, but I feel that switching him with Sol Mercado and the Beermen probably would have won anyways. Alabi is long and athletic. I just brought Solomon Alabi up as an excuse to show you this gif of Alabi punishing himself after missing a potential and-one. And then there’s Brian Hereula. His stats don’t stand out at all during this game, but he has a bull dog demeanor to his game and he’s built like one, too. Last conference, only five players averaged at least 9 points, 4 rebounds and 4 assists. Hereula was one of them along side Alex Cabagnot, Stanley Pringle, Jayson Castro, and Jonas Villanueva. Not a bad company to be in. 47 out of Blackwater Elite’s 87 shots were taken in the mid-range long two point area which accounts for about 54%. and they didn’t shoot that well from there either. 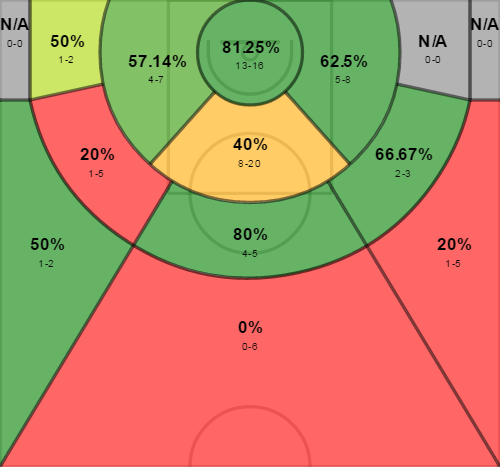 If anyone is familiar with the current efficiency trend in the NBA nowadays, that area is like the part of the floor that we pretended to be lava as kids. The fact that Blackwater takes so many of these shots and are struggling to win, speaks for itself as to why they are struggling. The entire PBA shot only 26.13% from that range in the last conference while Blackwater Elite shot 38.32% (stats as per Humblebola). It’s understandable as they had and have one of the smallest teams in the PBA but I’d rather them hoist up a millions three pointers. This was the game of the week even before the game began solely based on the talent level of the teams alone. But did anyone realize that this was “Miller Time”? Willie Miller is a former 2-time PBA MVP but went without a contract for the last PBA conference. Talk’N Text Tropang Texters picked him up for a back up point guard with veteran leadership after legend Jimmy Alapag decided to retire. Willie Miller’s return to the PBA was quite a performance. He took a lot of shots but didn’t convert as many. He used up a whopping 32.6% of TNT’s possessions while converting only 37.5 eFG%. So he wasn’t exactly efficient in his debut even though his line of 10 points, 3 rebounds, and 3 assists doesn’t look that bad. But it was refreshing to see that a player like Miller could still make an impact after being absent for quite some time. I’m a sucker for Rosser’s last name and for perfectly timed bounce passes. Rosser would be involved in my other two favorite moments of the game as well. 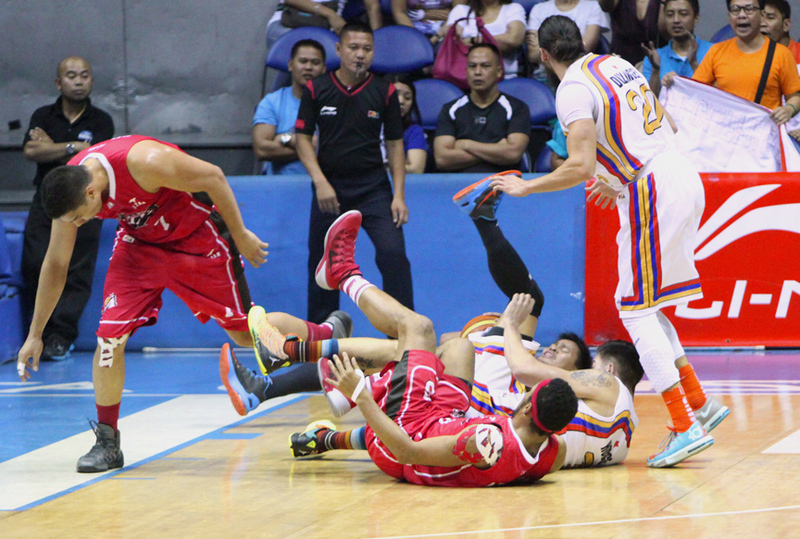 The first of them being the Beau Belga hip check on Rosser at the Baseline. Rosser is probably one of the skinniest guys in the league and Belga is one of the most beefed up guys in this league, and seeing this in slow motion is really just comical. But my most favorite random moment of the game was when Rosser rose up to block Rick Jackson’s shot attempt after he was fouled. It wasn’t really the block that caught my attention, but rather that Rick Jackson kept asking Rosser what was the point of his block. Someone has to turn this into a meme. Jackson then made the free throw and walked up to Rosser to probably remind him that his worthless shot block resulted in him scoring anyways. 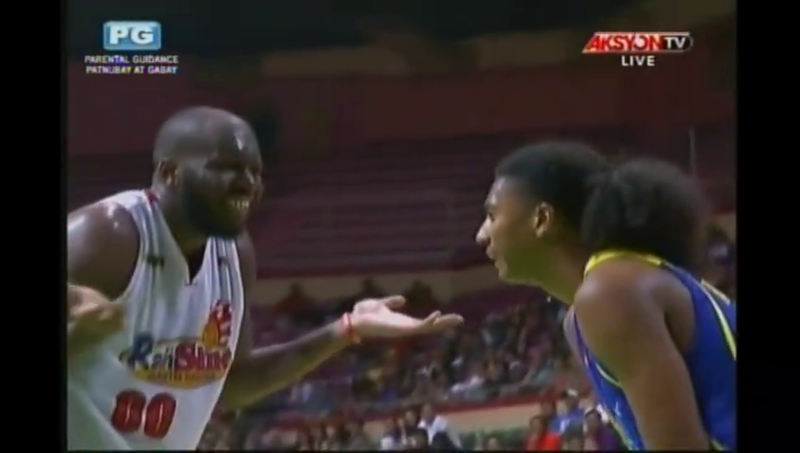 Rick Jackson is now tied with Peter John Ramos as my most favorite import. This game came down to the wire up until the last minute. Richard Howell had had a quiet offensive evening before hitting a huge go ahead basket only to have Jackson counter it immediately with a shot of his own which he had to run halfway down the court despite a timeout being called just to give Howell a brief stare down and grin. And with this match being all about Willie Miller, he made sure to mock Jackson’s shot posture walking into the timeout. I don’t know how we went an entire conference without this guy. Ranidel De Ocampo gave TNT another go ahead basket on the next possession down the floor with a difficult turnaround jumper. Rain or Shine ran a flurry of high ball screens before passing the ball to Rick Jackson for another mid range shot, which is just weird leading to Jason Castro going Rambo and hitting an unbelievable clutch shot to stretch the lead to 3. This would set up a Rain or Shine set piece with 5.2 seconds and with the courtesy of live television, we were able to know what Rain or Shine was going to run before the rest of the entire live spectators. Down three points with 5.2 seconds on the clock with a side ball at mid court, Yeng Guiao drew up a play and had me instantly screaming “ELAVATOR!”. It’s one of my favorite plays since playing in college because of how simple the concept is and how properly it’s named. 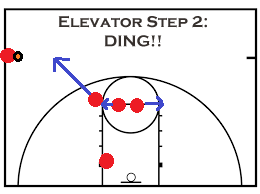 The offense sets up on the free throw line, and the furthest player (the Shooter/Elevator Passenger) take a huge curl towards the ball and heads into the paint, while getting a screen or two from his team mates. The guard (Receptionist) close to the ball taps out to get the ball in to play, because you only have 5 seconds to run this thing. The two big guys (Elevator Doors) at the free throw line spread apart slightly to the free throw line elbows. It is optional for them to yell out “DING!” to signal that the elevator door is open, but widely suggested to do so. 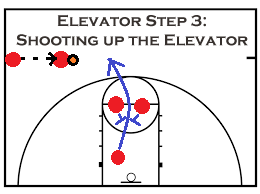 The Elevator passenger/Shooter then sprints through the gap as the Elevator Doors close (double screen from the two big men) gets the ball from the guard (receptionist) and launches the three. It is a really easy play to run and really fun if everything goes as planned. And as Rain or shine found out, that’s a big IF. TNT has the benefit of having a foul to give to view a snapshot of the play first so credit them for realizing this advantage. So when Rain or Shine had to run the play again, TNT were more prepared. Paul Lee started to curl with a nice block from Beau Belga losing Aaron Aban but couldn’t make it past Kevin Alas who was guarding Jonathan Uyloan. Rosser switched onto Lee, which was awesome defensive awareness and Aban switched onto Chris Tiu. Uyloan couldn’t get the ball off the inbound and dashed off to the far side while Tiu moved into get the inbound instead. 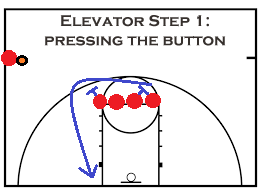 It was the correct move from Uyloan, if only he had realized that he should have gotten back to the free throw line as another Elevator Door. Instead, he drifted of the left side. Tiu now had the ball, but realized that Lee was not coming up an Elevator with only one door. Belga was aware enough of this and moved to set a straight up screen on Aaron Aban (again) who took it hard and left Tiu open for a split second. Paul Lee shot up the Elevator regardless of it not having a door, which is something no one should ever do. This might be easy to say in retrospect, but it might have cost Tiu an easier shot. Tiu was left with less space, and Paul Lee dragged long armed Matt Rosser up to annoy Tiu’s shot. All in all, it was a nice drawn up play but Talk’N Text were prepared and they adapted to the play extremely well, with a slight touch of luck. And there you have it, the Play of the Week from the Game of the Week. RDO has a quiet line of 14 points (6-9 shooting) with 11 rebounds and hit a very important go ahead bucket. Jason Castro scored 15 points (5-17 shooting) and hit the game sealer. I just want to say I liked RDO as Player of the Game more than the official announcing of Jayson Castro, but that’s just nitpicking. It’s been a fun week. Next week should be even more fun. 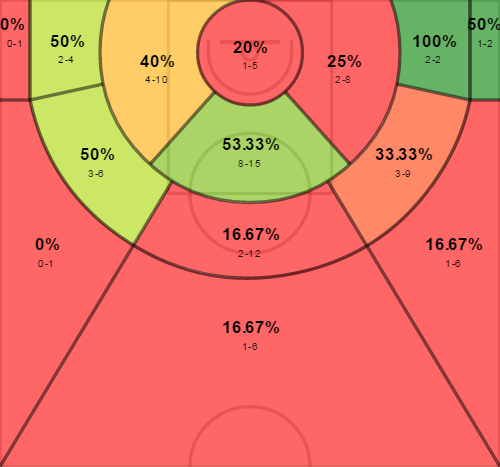 Note: Most advanced stats and ALL shot charts provided are taken from Humblebola. You can follow them at @HumbleBola_ on twitter as well. Cover photo is by Nuki Sabio taken from Talk’N Text’s official Facebook page.